While we were building WildVoice, the world changed, and podcasting became a less viable opportunity. Do-it-yourself multimedia publishing sites became common, and a few, like YouTube, came to dominate the market. Ubiquitous webcams, video capable cell phone cameras, and even new devices like The Flip camcorder made do-it-yourself video production practical. Video sharing sites took off in popularity, fueled by viral videos and often illegally posted copyrighted material. Video publishing sites quickly leapfrogged audio sites like WildVoice.com. Even while the Internet was being conquered by YouTube, dedicated audio podcasting sites were dealt another blow. Podcasting simply became an attribute of blogging platforms. For example, the WordPress blogging platform, with the correct plug-ins, could easily be used to create and host a podcast enabled blog. Finally, Apple’s iTunes store became the de facto podcast directory on the Internet. Most listeners looking for podcasts went to iTunes to find them. iTunes gave users access to thousands of podcasts, but it also presented a curtain that hid the underlying podcast hosting sites from listeners. This meant that any podcasting site looking to generate revenue through visual web advertising would have fewer eyeballs coming to their site. Users would find and download their podcasts through iTunes and they would rarely click through to find the underlying hosting site and see its advertising. We set out to create WildVoice® Studio and WildVoice.com with the simple goals of creating easy to use tools and seamless hosting to allow anyone to create and publish podcasts. We formed Equicast Media in the summer of 2005 and by the spring of 2006 we were online with a beta version of the WildVoice.com podcasting site and a beta version of WildVoice Studio. 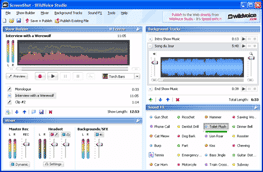 Most popular audio tools for home computers are fairly complex. They are often modeled as multitrack editing applications that excel and letting users carefully layer and edit recordings. These require a great deal of skill and time, but can produce professional sounding results. We took a different approach for WildVoice Studio. Our goal for WildVoice Studio was to create a Windows application to lets users easily create podcasts. WildVoice Studio captures the spontaneity of a live radio talk show. It presents a sound effects panel, a panel for playing prerecorded audio (like music or interviews), and the ability to record live audio while inserting sound effects or overlaying prerecorded tracks. It also lets you record clips that can then be merged into a single recording. Most importantly, WildVoice Studio includes one-click publishing to free hosting at WildVoice.com. During the publishing process from WildVoice Studio, an MP3 file is created, tagged, and posted to a user’s site on WildVoice.com. WildVoice.com provides free podcast hosting and easy to use publishing features. Users simply post their audio files, create show notes or a blog-like posting, include a picture and the site does the rest. RSS feeds are automatically generated by the site and there are no special technical skills required to create and publish a podcast. The site also includes a simple web based audio recorder for users who do not have access to WildVoice Studio. Other features let users include a Adobe Flash based audio player to play their podcast in other sites like MySpace or blogs. In the spring of 2005, podcasting was beginning to get attention in the press and growing in popularity on the Internet. Podcasting lets ordinary people create their own Internet “radio” shows that can be download and listened to at any time. Unlike earlier Internet radio trends, podcasting provided a model for shows to be created, published to the web, and the listened to at any time in the future. Podcasting removed the need to listen to the live stream that Internet radio typically required. Podcasting was a new medium that allowed anyone to publish audio programming to the Internet. The buzz regarding podcasting was that like blogging before it, podcasting would a massively popular way for ordinary people to share do-it-yourself media on the Web. download and install an FTP program (FTP is a common application protocol used to transfer files on the Internet). These steps were great fun for technical folks who love to explore any new technologies on the Internet, but for most people they made podcasting impractical, if not impossible. We thought podcasting was a great idea and an exciting new medium. However, when we looked at the daunting steps required for people to create and publish a podcast, it was clear to us that there had to be a better way. In the 1990s, when web publishing was new, it was very difficult for individuals to create and publish web sites or web pages. Tools like FrontPage, PageMill, and Dreamweaver were created to make it easy for people to create and publish content without needing to know or understand the inner workings of HTML and Internet protocols. Hosted services, especially blogs, provided easy to use content management and publishing systems for ordinary web users. When we set out to create WildVoice® Studio and WildVoice.com, it was our expectation that the podcasting would follow a similar trend. We firmly believed that once the right tools and hosting services were available to allow people to easily create and publish podcasts, podcasting would become as popular as blogging. If you're new to podcasting, take a look at this great video produced by the folks at Common Craft. This post is using Microsoft Skydrive for hosting the MP3, Flash SWF, and the WildVoice Studio EXE.